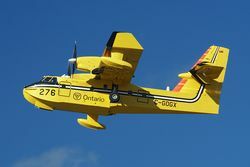 To prepare for the 2011 fire season, County Mayor Michael D. Antonovich announced that the Board of Supervisors authorized a contract to lease two CL-415 SuperScoopers fire-fighting aircraft from the Government of Quebec for use by the Los Angeles County Fire Department. “To ensure our County Fire Department has the tools they need to be fully prepared for fire season, these vital aircraft have been requested to supplement the Department’s water-dropping helicopters and other fire-suppression machinery,” said Antonovich. SuperScoopers are a fixed-wing aircraft that can carry up to 1,620 gallons of water and takes only 12 seconds to scoop water from a lake and inject it with fire-resistant foam – a combination up to 3 times more effective than water alone. They can be airborne in as little as five minutes and fly three hours before refueling. The SuperScoopers are expected to arrive on Monday, September 1, 2011, and will be placed into service through November 31, 2011.